Elise Frösslind was an opera singer and an actress at the Kongliga Theater (royal theatre) in Stockholm who was one of the cornerstones of that theatre’s ensemble during the 1800s. She was also a member of the Musikaliska akademi (academy of music). Elise Frösslind was born in Stockholm in 1793. Her two younger brothers died in infancy. Following the death of her father she was enrolled – aged only 11 – at the Opera’s new school for singers. It is likely that her mother wanted to give her an education which would enable her to have a career that would allow her to earn her living. 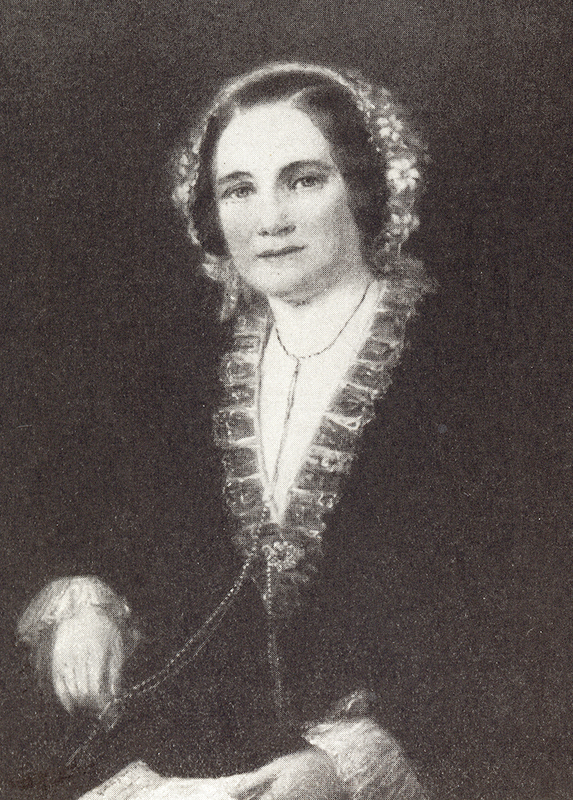 The school gained a new director called Sophia Lovisa Gråå in 1806. Elise Frösslind moved into the students’ home which was run by Gråå. Elise Frösslind already brought attention to herself as a student. When she was 16 years old she and two of her friends complained to their superior, A.F. Skjöldebrandt, about their teacher J.F. Wikström’s heavy-handed teaching method, which included discipline forms which were seen as excessively brutal, even at that time. Their complaint led to Wikström’s replacement as a teacher of solo singing and the female students were lauded for their actions. Elise Frösslind, who had been the one to speak on behalf of the students, thus displayed her moral courage and bravery in standing up to injustice and authority from an early age. In 1811 Elise Frösslind – who was still a student at the time – was given the title role in the lyrical drama Cendrillon (Cinderella), against voiced dissent from the rest of the members of the ensemble. At barely 18 years of age Elise Frösslind found success in portraying the virtuous but bullied hearth-cleaner who wins the love of a prince and becomes a princess. She embodied the idea of the eternal feminine in her portrayal of Cinderella, that is, in a femininity that was innocent, ‘natural’, transparent, and humble. According to the beliefs of the time theatre was to be both entertaining and educational. Cendrillon fulfilled these characteristics by offering both music and dance which appealed to both the ears and the eyes of the audiences. Elise Frösslind became a favourite of the Stockholm audiences after her performance as Cinderella. The production gave rise to a debate in the papers regarding acting styles. Pehr Adam Wallmark, of Journal för Litteraturen och Theatern, did not consider Elise Frösslind’s portrayal of the transformation from a hearth-cleaner to a princess a convincing one. He felt that she did not satisfyingly embody the new exalted position of princess. Other reviewers defended Elise Frösslind. The debate clarified that there were two camps: one comprising an older, more stylised form of acting, whilst the other camp (who defended Frössling) promoted a new, more ‘natural’ acting style. The debate ended when Journal för Litteraturen och Theatern had to eat humble pie and ask Elise Frösslind for an apology. The keywords of the debate – authenticity, naturalness and naivety – all bore witness to a new aesthetic emerging within Swedish actors’ acting style and beginning to gain ground. Elise Frösslind became employed at the Kongl. Theater as an actress in 1813 and shortly thereafter she married her colleague Carl Gustaf Lindström, who was 14 years her senior. He was one of the most successful tenors at the theatre in the period between 1800 and 1844. Elise Frösslind and Carl Gustaf Lindström became a popular stage couple who were often cast opposite one another. Over the course of five years they had five children together. During that time Elise Frösslind remained fully active professionally, such as in 1816 when she had to rapidly learn the role of Dona Anna in Mozart’s Don Juan. The next year she was appointed as a member of the Musikaliska akademi. However, the marriage appears to have come to an end after five years and the couple went their separate ways. Lindström was known for his inability to manage his financial affairs despite his intermittently very good salary. In 1831 he was placed under a guardian and Elise Frösslind was keen for that situation to continue. That same year the couple divorced and Elise Frösslind then went back to using her maiden name for public purposes. They continued to act opposite eachother and sometimes also acted with their eldest daughter Carolina, who was employed at the theatre during the 1833-1834 period. Although Cendrillon remained Elise Frösslind’s greatest success, she was remarkable in many other roles which have left their mark in the history of the theatre. In 1812 she portrayed the lead female character Pamine in the Swedish premiere of Mozart’s Trollflöjten. That same year she played Antigone in Antonio Sacchini’s Oedip i Athen. Her parts tended to be that of the ingénue, that is, the innocent young girl, but she could also play the saucy soubrette and the cheerful, attractive young wife, such as Madame Pinchon in Eugèn Scribe’s Passionen och förnuftet. This was her favourite role. One of her greater successes in 1824 was the role of Zetulbé in Den lilla slafvinnan, a part that called for both singing and dancing. It was based on the melodrama Ali Baba, ou le Quarant Voleurs by Guilbert Pixérécourt using themes from the Thousand and One Nights story. Zetulbé the slave is the lead character of the drama and is present on stage for most of the performance. Elise Frösslind also played Zetublé as a type of ‘underdog’ who saves her family from ruin through her courage, loyalty, and honour. Elise Frösslind even played boy’s parts successfully, such as that of Cherubin, the page, in Mozart’s Figaros bröllop. Elise Frösslind was not a classic beauty but had a dainty figure and was particularly lovable. She retained her youthful and slightly naïve charisma even when she was older. The author and journalist Nils Arfvidsson described her acting style thus: ‘She portrayed the tender and innermost aspects as genuinely and artistically as she did the quick-witted, naïve, and spirited and, similarly, she was top-notch in portraying the silly, namby-pamby, stupid, and churlish. She was a sure and confident interpreter of nobility and dignity, in so far as it fell within comedy and did not call on the resources of tragedy. She displayed taste and feeling in every role she played.’ Elise Frösslind’s singing voice was not powerful but it was pure and sweet, as was her spoken voice. She was viewed as a bridge-builder between the singing and spoken scenes at the Kongl. Theater and was considered to be equally talented in both spheres. When it came to her ‘recettes’- namely, those performances where the actor was solely responsible for both the artistic and financial elements and could retain the income generated by ticket sales – Elise Frösslind often presented new pieces. In April 1832 she put on a production of Beethoven’s only opera, Fidelio, at her own expense, thereby introducing the piece to the Swedish public. The title role of Fidelio/Leonora was performed by the popular opera singer  (Henriette Widerberg), whilst Elise Frösslind herself performed the part of Marcellina. The reviewers did not react entirely positively to the production. Apart from Widerberg, who was considered excellent, the production was not considered to be satisfactory. The weekly Heimdall only mentioned the very young  (Jenny Lind)’s performance. When Elise Frösslind was just over 40 years old a dispute arose between the employees and the management of the theatre which has come to be known as the Torsslow feud. The boss of the theatre, Per Westerstrand, decided that the ensemble should be dismissed and that new regulations should be introduced as the theatre was forced to make cuts. Elise Frösslind was dismissed with a pension that was about a third of her previous salary. The reason given was her age and increasingly poor health. On 17 January 1835 she had her final performance and then gave a speech to the audience in which she said she was regretfully leaving the stage. That autumn Westerstrand called for Elise Frösslind to be reinstated. He stressed that as she was a divorced woman she had obligations towards caring for her children and that she had been judged liable to pay her divorced husband’s debts. She was subsequently reinstated but the roles she had made popular were now being performed by younger actors such as  (Emilie Högqvist), in the spoken dramatic roles, and Jenny Lind in the sung repertoire. Despite all this, Elise Frösslind portrayed Zetulbé as late as 1838 when she was 45 years old. At a ‘recette’ on 16 June 1836 Elise Frösslind introduced a new genre to the Kongl. Theatre, the tableau vivant, namely, a living image created with actors and the necessary set exactly as depicted in a given well-known painting, with musical accompaniment. She paid for the production herself, which was based on Raphael’s The Ecstasy of Saint Cecilia. According to the literary and theatre historian  (Ingeborg Nordin Hennel) the theatre launched this tableau vivant as a ‘worldly supplement to the church pulpit as a clear counterpart not least to the womanhood which the actress accordingly represented in the visual template.’ This new genre was well-received by the audience, and Elise Frösslind’s youngest daughter Emilie Frösslind, who played the part of Mary Magdelene, received particular acclaim. Little is known of Elise Frösslind as a private individual, apart from that she socialised with Emilie Högqvist, and spent Christmas 1844 with her. During two of Elise Frösslind’s lengthy periods of illness, in 1833 and 1840-1841, her colleagues put on performances such as that at the Kirstein house after which they donated the takings to her. Elise Frösslind was active at the Kongl. Theater until 1845. During the last decade of her professional life she performed less and less. Thus her salary shrank whilst her requests to put on ‘recettes’ were knocked back. Her last stage performance was on 7 November 1845, when she played the small role of the nun in Auber’s Den svarta dominon. After that Elise Frösslind lived off her pension. Elise Frösslind spent her final years living in comparatively modest conditions. Her estate revealed that she had a small surplus. Her rheumatism had worsened with old age and it is probable that she suffered from uterine cancer. She died in Gothenburg in 1861 when she was visiting her youngest daughter Emilie. She was buried in that town. Christina Elisabeth (Elise) Frösslind, www.skbl.se/sv/artikel/EliseFrosslind, Svenskt kvinnobiografiskt lexikon (article by Hélène Ohlsson), retrieved 2019-04-26.